Portugal will hold legislative elections later this year. Patrícia Calca writes on the lead up to the vote, noting that in contrast to countries like Greece and Spain, the Portuguese party system has remained relatively stable since the financial crisis. While there has been no emergence of anti-austerity parties like Syriza and Podemos, however, the election will nevertheless be crucial in shaping Portugal’s attempts to manage its economic recovery. The shortest route between Lisbon and Brussels is about 2,000 kilometres, with the only path over land going through Spain. Perhaps it is this distance, alongside the fact that the country’s history has traditionally been oriented toward the Atlantic Ocean, that explains why for most Portuguese citizens the European Union remains something of a distant reality. For the importance of the EU to Portugal is not always clear to its citizens. Its popularity is now lower than it has been for several years and, recently, an accompanying sense of uncertainty is discernible in Eurobarometer results and other opinion polls. Combined with the disastrous effects of the financial crisis, the EU is now a marginalised feature of Portuguese politics, despite Portugal itself being central to the debate over the euro and the future of the EU. With an economy in a period of slow recovery, Portugal is still confronting a glut of serious problems. The most severe are direct consequences of the crisis. Social inequality is increasing. At the same time, a general deterioration of living standards stands as testimony of the imbalances the country faces. The indicators are crystal clear: high unemployment rates; high levels of emigration, mainly among the young and educated causing a severe ‘brain drain’ effect; cuts to healthcare; increasing taxes on citizens, based mainly on the contributions of civil servants and pensioners; and cuts in funding for education and science, are just a few examples. Austerity has had a lasting impact on the development of the welfare state in Portugal, and the country has been damaged in ways that are still hard to assess in their totality. Against this backdrop, however, Portuguese citizens will go to the ballot box for legislative elections in the autumn which will determine the nature of the country’s next government. To have a better notion of the institutional framework in Portugal it is worth underlining how the system is composed and works. Portugal has a semi-presidential system, with the government, parliament and President of the Republic forming the centrepieces of the country’s politics. The Prime Minister is invited to form a government by the President, according to the results of the legislative elections. Elections are held every four years to determine all 230 members of parliament. The MPs are elected in closed lists presented by the parties in 22 multi-member districts. The Portuguese system uses the d’Hondt method of proportional representation in order to convert votes into seats and this, usually, gives rise to a majority for one of the two main parties: on the left there is the Socialist Party (PS) and on the right is the Social Democratic Party (PSD), which is currently in coalition with the CDS – People’s Party (CDS-PP). In the 41 years of Portuguese democracy, one or the other has generally been included in the country’s government. It is in this context that the 2015 elections will take place. While there is often assumed to be an ‘incumbency advantage’ for the party in power, the most recent polls show that the Socialist Party has an advantage over the two governing parties (the PSD and CDS-PP) at present. The coalition’s attempts to manage the crisis are likely to have had a negative effect on voters’ perceptions of the government’s performance. Following the last legislative elections in 2011, the government had to deal with conditions stipulated by the ‘Troika’ and the associated financial constraints. The chart below illustrates how the polling picture changed in the four years between May 2011 and May 2015. Note: The parties are the Socialist Party (PS); the Social Democratic Party (PSD); the Left Bloc (BE); the CDS – People’s Party (CDS-PP); and the Democratic Unitarian Coalition (CDU). The results presented in this chart are monthly averages of the several polls made between May 2011 and May 2015. For more detailed information about this data see here. 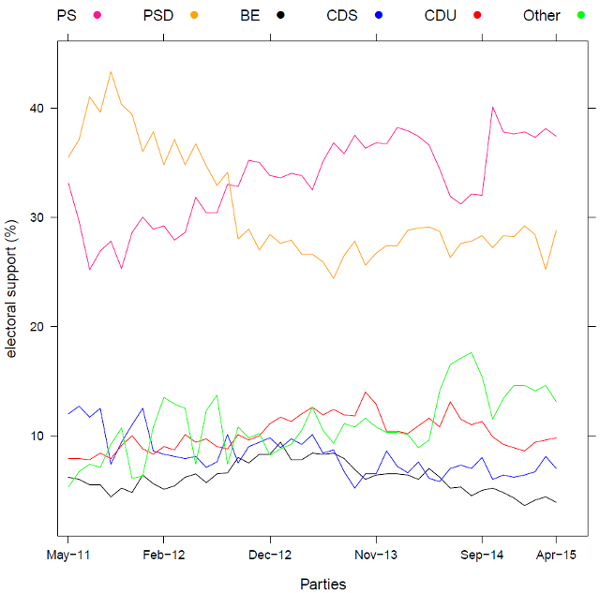 The chart illustrates the gradual increase in support for the PS since 2012, with a corresponding drop in support for the PSD. The gap between the two parties is largest between May and September 2013, and between September 2014 and the start of May 2015. One aspect which is interesting in Portugal, given the rise of parties such as Podemos in Spain and Syriza in Greece, is the relative lack of change in the party system which has occurred during this period. While some new movements and parties have indeed emerged, notably the ‘socialist-ecologist’ LIVRE/Tempo de Avançar and the ‘reformist’ Juntos Pelo Povo, this has not been on anything like the level experienced in other countries. A plausible explanation for this is that the traditional parties have simply adapted better to the changing circumstances or have found ways of incorporating conflicting perspectives into their party organisation. Primary elections held by the PS offer an example, whereas the governing coalition on the right of the party spectrum has arguably proven better at representing its core supporters than other centre-right parties across Europe. There may also be a lack of interest in active political participation in Portugal which has made it difficult for new movements to garner support. If in politics the electoral campaign starts from the day after the previous election, it is also true that parties make their decisions strategically, calculating the effect of their decisions and the other parties’ possible reactions. In the Portuguese case, the legislative elections of 2015 have to be seen in combination with the Presidential elections due for 2016. While there is still some time until the legislative elections, and even longer until 2016, the time for campaigning is shorter than it seems as the majority of political actors will be on a break during the month of August. But if this is a good time to relax and for citizens to consider the best candidate to vote for, it is also a time when the population traditionally disconnects from politics. This may or may not play a role in the nature of the campaign, but whichever party emerges victorious, the elation of the victor will no doubt pass quickly as the reality of Portugal’s economic situation, still shaped by the fallout from the financial crisis, moves back to the top of the political agenda. Patrícia Calca is a political scientist based in the Institute of Social Sciences at the University of Lisbon. It is said that a week is a long time in politics. Although this is only one poll, missteps and gaffes by the recently elected leader of the PS and former mayor of Lisbon, Antonio Costa, together with the ongoing fall-out of the criminal case against the previous Prime Minister, Jose Socrates and a growing opinion among the “povo” that they would prefer to stay with the current “reasonable stable” administration, particularly in the light of the ongoing Grexit saga, indicates that the Portuguese may, despite the terrible harshness of recent years, vote in favour of keeping the current Government in power. 2 years ago in cyprus the first time bail in ….now its greece ….protect yourselfs from a third bail in in europe …. Your article fails to mention that the PS have been veering more and more into Syriza/Podemos rhetoric and policy positions.